The gardeners of West Lothian are very obscure, but enough survives to outline the history of several lodges. 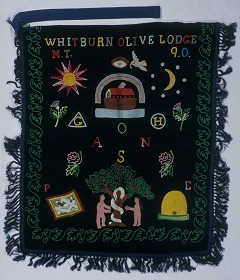 There was a cluster of lodges, perhaps associated, that used the descriptive term 'olive' in their titles: Bathgate Olive Lodge, Armadale Olive Lodge, and Whitburn Olive Lodge, which were founded in 1863, 1880 and 1891 respectively. Evidence from surviving artefacts shows the affiliation of some of these. Armadale was a lodge in the Western Grand Lodge of the Scottish Order of Ancient Free Gardeners and was probably thus also affiliated to the St Andrew Order of Ancient Free Gardeners Friendly Society, the order's benevolent rather than craft arm. 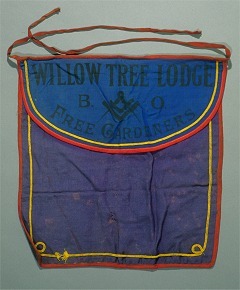 In contrast, the Willow Tree Lodge of Linlithgow was affiliated to the British Order of Ancient Free Gardeners where it was number 200. It was established in 1889 with twenty members and a capital fund of £8. An early piece of regalia appears to be home made, but the lodge flourished and was able to afford to purchase official equipment at some later date. Some has been identified as manufactured by the firm of Kenning and Company of Manchester. All the lodges appear to have closed at relatively early dates. Bathgate closed in 1915 but records show Armadale survived until at least 1943.